Do you have a Radiologic Technologist certification? You worked hard and passed that exam. Congratulations! Now it’s time for the job hunt. Lucky for you, the need for radiologic technologists is still growing. In fact, more than 30,000 new RTs are needed by 2026. The American Registry of Radiologic Technologists exam for certification is the first step to starting your job hunt. Now it’s time to polish your resume, practice your conversation skills and NAIL THAT INTERVIEW! 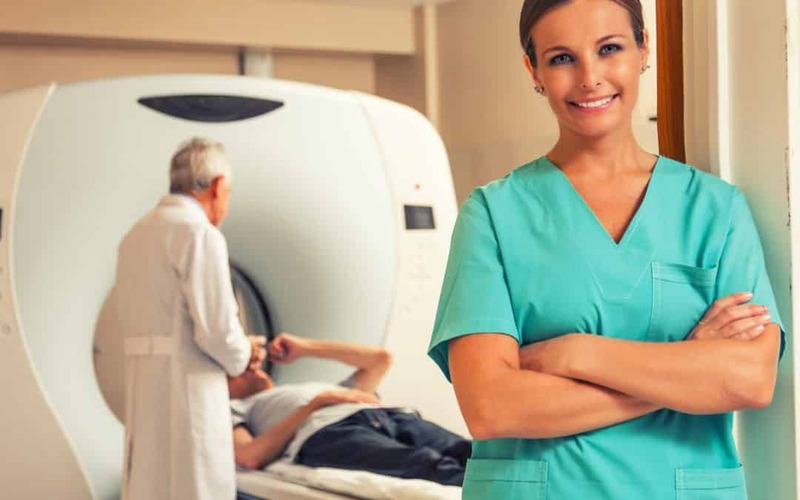 Radiologic technologist jobs are unfilled in almost every state in the U.S.
Read on to learn more about scoring the job of your dreams. Radiologic Technologist Jobs – Now What? Start your job hunt with a positive attitude. We collected these tips and advice for the application process and interview, so you can step in with confidence. Part of your preparation for the RT certification was clinical practice, so the job hunt shouldn’t be too unfamiliar. Your radiologic technologist career network involves personal, professional, and academic contacts to connect you to your field. Your connections can help you get hired. They can push you to grow your career. You can’t argue with success. The question for many people is: Who is my network? A personal connection can be your way “in” to a job. Oftentimes, the perfect job isn’t even created until you let someone know you are looking. For an RT, there are many jobs waiting to be filled, it’s just a matter of finding the right one for you! Just don’t depend on job listings only. Radiologic Technologist jobs listings should give complete descriptions of the responsibilities and requirements for the position. They also contain a “wish list” for the characteristics you should bring the organization. Compare the job description your background and experience. Look at your own resume to determine if you have a good fit. Look for hints that you can use to adjust your resume or cover letter, such as “..required to process patient records.” This gives you an opening to highlight your organizational skills and experience. This also opens up some different conversation topics for your interview. Review your qualifications for the radiologic technologist position listed. You should meet the minimum legal requirements. Your new certification and licensing put you ahead of most applicants already. Measure your level of experience and position yourself to meet the challenges of the position. Depending on the state where you seek work, radiologic technologists certification and licensing are required. Before your interview, have your credentials on hand and your plan for ongoing education in mind. Don’t talk yourself out of a job. You will 100% fail to get interviews for the jobs you don’t apply for. Oftentimes a combination of education, experience, and on-the-job training can substitute for required skills. If you do your homework, it shows the interviewer you value the job and their time. Part of your homework is to determine your fit in a particular job. For example, in some clinical settings, being a radiologic technologist is a physically demanding job. They are on their feet 8 or more hours at a stretch. They lift and reposition medically fragile patients throughout the day. You must decide if this type of work is for you. Prepare questions to help your interviewer understand that you have thought about the job. Expect your interviewer to ask you open-ended questions. You must be prepared. Practice more than “Yes” and “No” answers. What do you say to uncooperative patients? How would you handle a co-worker who is not following regulations? Try to practice answering the questions naturally and with confidence for the interview. Don’t make it a one-way conversation. Make your own list of questions for you to ask your interviewer. Don’t be afraid to bring a neat notebook to your interview. When you sit down, ask the interviewer if they object to you taking notes. In most cases, interviewers will consider this a positive. Use your notes to help you remember the information given to you. For example, your interviewer may review some job details not included in the listing. Note things that are important to you or relevant to your skill sets, like work environment, hours, salary range or travel. Note the name of your interviewer. It is embarrassing to forget– and sometimes nerves get the better of you. Don’t rely 100% on memory to remember information. Some interviewers will even pause and wait for you to jot down thoughts. At the end of the interview, thank your interviewer. Getting your foot in the door is the key to beginning your career as an RT. You have the education; you have clinical experience, now you are ready for that job! Still working on earning your certification? It’s never too early to think ahead. Read on for more helpful information.